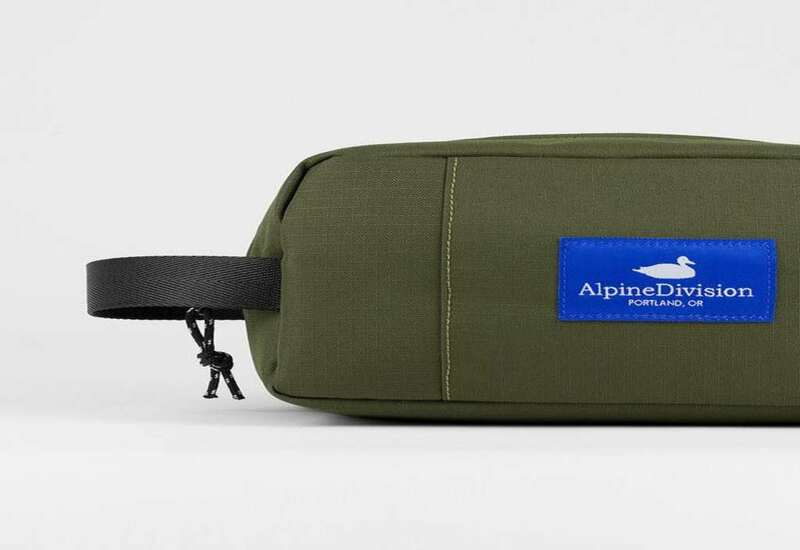 Alpine Division Green Ripstop Bag Collection Giveaway Winner: Congratulations to Zane L. of Lubbock, TX, winner of the Alpine Division Green Ripstop Bag Collection. Thanks to all entrants, and be sure to check the Dude homepage or Dude Giveaways section for your chance to enter our latest prize drawing. This giveaway concluded on October 1, 2017. 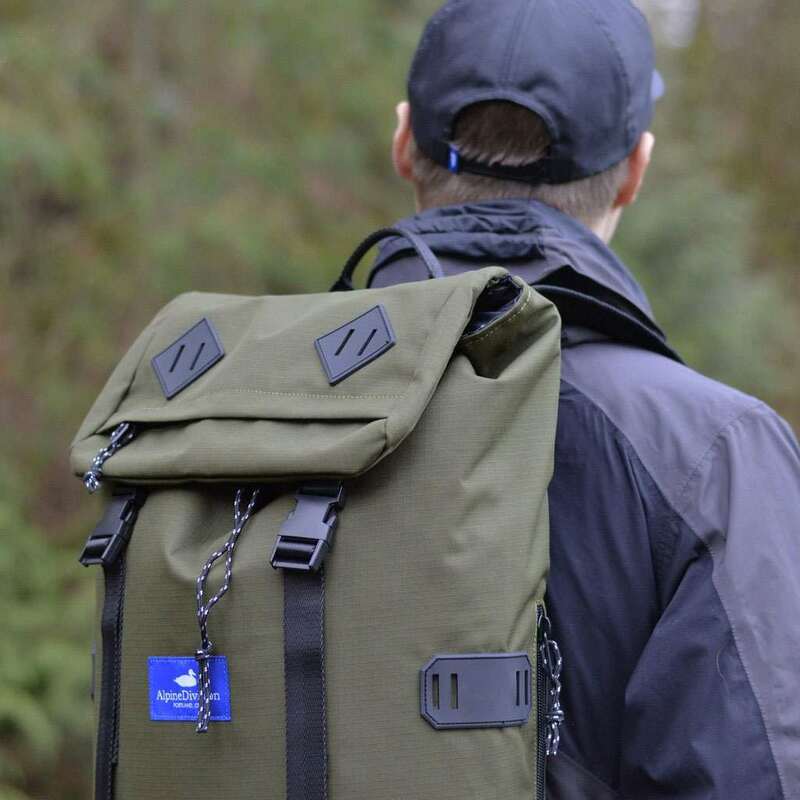 In the office or in the outdoors, to the gym or to the airport, Alpine Division bags are functional, hardy, and "quacky" enough to serve any activity or environment. 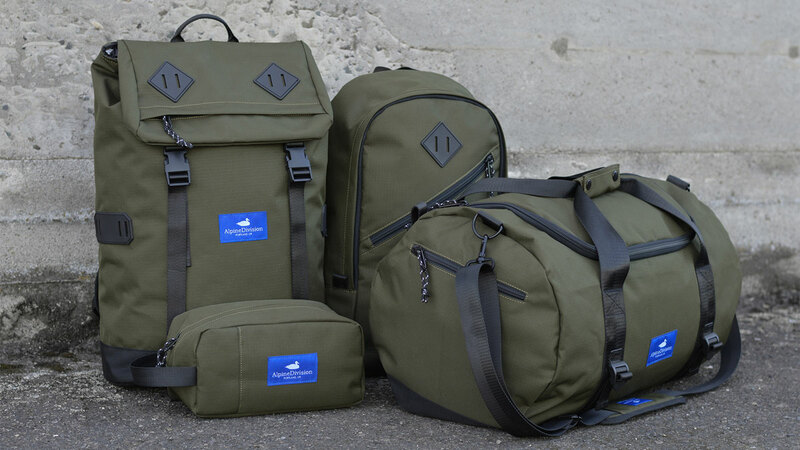 Click here and enter to win a set of 4 fine bags from the company's new Ripstop Collection. A $256 value from Alpine Division! 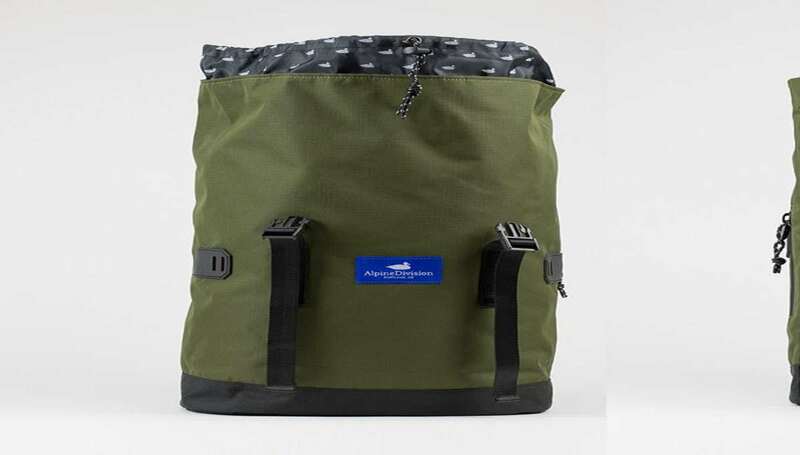 The McKenzie Green Ripstop Bag. Inspired by the 70s rucksack, this bag combines clean lines with vintage styling. 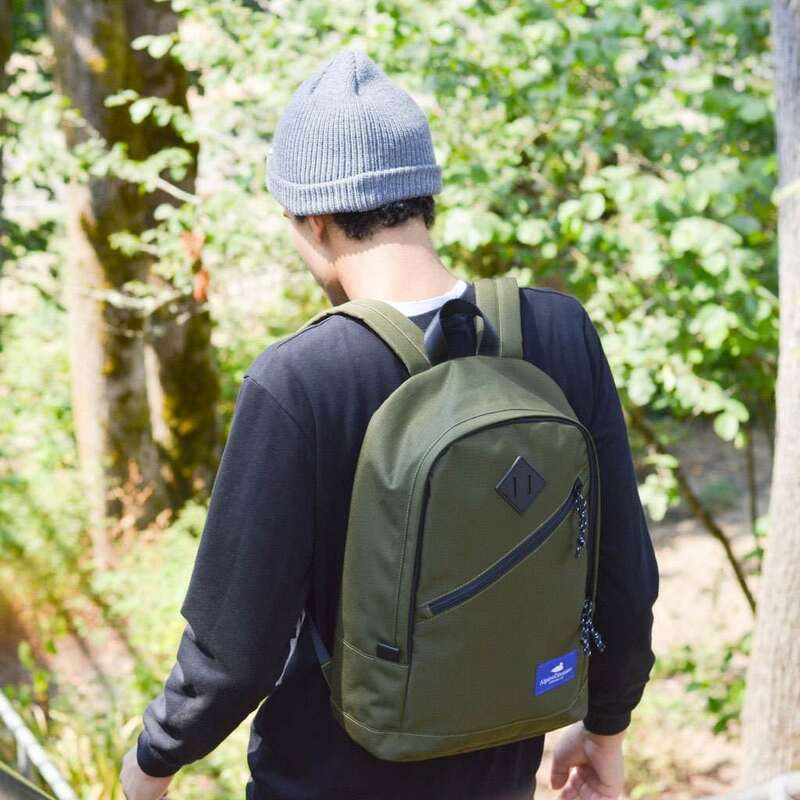 Take the McKenzie on a day hike, or take advantage of its padded laptop sleeve and easy access phone pocket for work and school commutes. Dimensions are 12.5" x 7" x 20". The North Fork Green Ripstop Bag. A classic duffel primed for travel. A 45L volume makes the North Fork small enough to stuff in an overhead bin on the plane, but still TARDIS enough on the inside to accommodate a few days' worth of clothes and toiletries. Dimensions are 21" x 12.5" x 12.5". 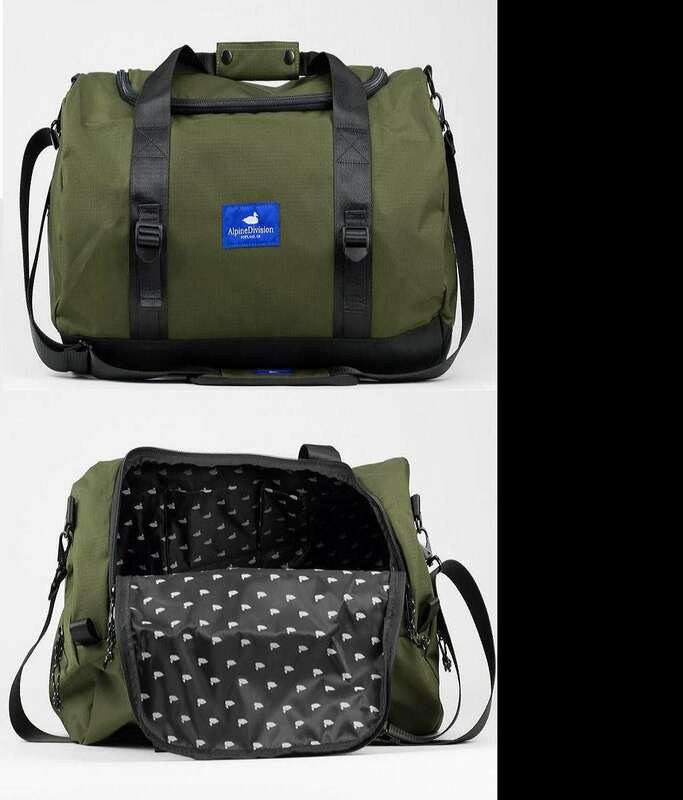 The Eliot Green Ripstop Bag. Your compact daypack. A diagonal zipper gives easy access to EDC, while interior zippered pockets give more coverage to sensitive items, and a padded laptop sleeve provides protection for your electronic Mini Me. Dimensions are 12" x 5" x 17". The Sherpa Green Ripstop Bag. An Alpine Division ducky dopp kit with an exterior zipper pocket and webbing handle. Dimensions are 10.5" x 4.5" x 5". To register, click here and fill out the Alpine Division Green Ripstop Bag Collection Giveaway entry form. Or, if you're already a member of DudeIWantThat.com, when the magic entry form button appears, just click it to enter. Giveaway prize includes 1 x McKenzied Green Ripstop, 1 x North Fork Green Ripstop, 1 x Eliot Green Ripstop, and 1 x Sherpa Green Ripstop bag. Combined retail value is $256. Alpine Division Green Ripstop gear is all sold separately and available for immediate purchase here. The company's online store also carries their bags and hats in non-green color schemes, such as Black, Navy, Grey, and Arctic Blue.